An artistic rendition of the earth, earth's magnetosphere, and the sun accurately portrays to scale the earth and its magnetosphere, while grossly distorting the relative size of the sun and its distance from the earth. An accurately scaled representation, taking the size of the earth as a scale reference, would have the sun enlarged roughly seven times and placed roughly 1160 times further away. A magnetosphere is a dynamically varying tear-drop shaped region of plasma comprising magnetic fields and charged particles surrounding a magnetized astronomical object, whether it is a planet (like the earth), a planet’s moon (like Jupiter’s Ganymede), or a star (like the sun). The sun’s magnetosphere, which is called the heliosphere, is larger than the solar system itself and is characterized by the solar wind (a plasma of mostly electrons and protons) flowing outward from the sun and past the most distant planet. The tear drop shape of a magnetosphere arises as the magnetized astronomical object with its surrounding magnetic field and charged particles passes through ambient plasma. For the earth’s magnetosphere the ambient plasma is the solar wind and the magnetosphere shields the earth from the solar wind’s powerful effects. For the heliosphere the ambient plasma is the interstellar medium. In addition to the earth, the magnetized planets Mercury, Jupiter, Saturn, Uranus, and Neptune are all surrounded by a magnetosphere. 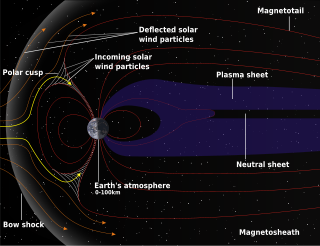 Human knowledge of the magnetosphere dates from 1958 when the first U.S. earth-orbiting satellite, Explorer 1, detected a belt of charged particles (later named the Van Allen radiation belt), trapped by the earth’s magnetic field. Subsequent studies have mapped and labeled the magnetosphere revealing that in the downwind side of the planet the long tear-drop shape of the magnetosphere can extend out to as much as 200 earth radii. Also, it is at the far end that variable openings in the magnetosphere at times permit some of the solar wind particles to flow into the magnetosphere. Some of these circulate back to the earth and may even flow along magnetic field lines at the poles to produce the auroras. The discipline of space physics is largely the study of magnetospheres because their magnetic fields and plasmas are pervasive throughout space, except for the surfaces and interiors of the planets. The Earth's magnetosphere was discovered in 1958 by Explorer 1 during research performed for the International Geophysical Year. Before this, scientists knew that electric currents existed in space, because solar eruptions sometimes led to "magnetic storm" disturbances. No one knew, however, where those currents were and why, or that the solar wind existed. In August and September of 1958, Project Argus was conducted to test a theory about the formation of radiation belts that may have tactical use in war. The magnetosphere of Earth is a region in space whose shape is determined by the extent of Earth's internal magnetic field, the solar wind plasma, and the interplanetary magnetic field (IMF). In the magnetosphere, a mix of free ions and electrons from both the solar wind and the Earth's ionosphere is confined by magnetic and electric forces that are much stronger than gravity and collisions. In spite of its name, the magnetosphere is distinctly non-spherical. On the side facing the Sun, the distance to its boundary (which varies with solar wind intensity) is about 70,000 km (10-12 Earth radii or RE, where 1 RE=6371 km; unless otherwise noted, all distances here are from the Earth's center). The boundary of the magnetosphere ("magnetopause") is roughly bullet shaped, about 15 RE abreast of Earth and on the night side (in the "magnetotail" or "geotail") approaching a cylinder with a radius 20-25 RE. The tail region stretches well past 200 RE, and the way it ends is not well-known. The outer neutral gas envelope of Earth, or geocorona, consists mostly of the lightest atoms, hydrogen and helium, and continues beyond 4-5 RE, with diminishing density. The hot plasma ions of the magnetosphere acquire electrons during collisions with these atoms and create an escaping "glow" of fast atoms that have been used to image the hot plasma clouds by the IMAGE mission. 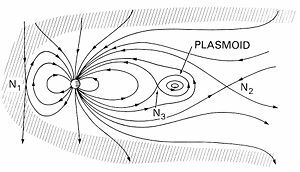 The upward extension of the ionosphere, known as the plasmasphere, also extends beyond 4-5 RE with diminishing density, beyond which it becomes a flow of light ions called the polar wind that escapes out of the magnetosphere into the solar wind. Energy deposited in the ionosphere by auroras strongly heats the heavier atmospheric components such as oxygen and molecules of oxygen and nitrogen, which would not otherwise escape from Earth's gravity. Owing to this highly variable heating, however, a heavy atmospheric or ionospheric outflow of plasma flows during disturbed periods from the auroral zones into the magnetosphere, extending the region dominated by terrestrial material, known as the fourth or plasma geosphere, at times out to the magnetopause. Two factors determine the structure and behavior of the magnetosphere: (1) The internal field of the Earth, and (2) The solar wind. The internal field of the Earth (its "main field") appears to be generated in the Earth's core by a dynamo process, associated with the circulation of liquid metal in the core, driven by internal heat sources. Its major part resembles the field of a bar magnet ("dipole field") inclined by about 10° to the rotation axis of Earth, but more complex parts ("higher harmonics") also exist, as first shown by Carl Friedrich Gauss. The dipole field has an intensity of about 30,000-60,000 nanoteslas (nT) at the Earth's surface, and its intensity diminishes like the inverse of the cube of the distance, i.e. at a distance of R Earth radii it only amounts to 1/R³ of the surface field in the same direction. Higher harmonics diminish faster, like higher powers of 1/R, making the dipole field the only important internal source in most of the magnetosphere. The solar wind is a fast outflow of hot plasma from the sun in all directions. Above the sun's equator it typically attains 400 km/s; above the sun's poles, up to twice as much. The flow is powered by the million-degree temperature of the sun's corona, for which no generally accepted explanation exists as yet. Its composition resembles that of the Sun—about 95 percent of the ions are protons, about 4 percent helium nuclei, with 1 percent of heavier matter (C, N, O, Ne, Si, Mg… up to Fe) and enough electrons to keep charge neutrality. At Earth's orbit its typical density is 6 ions/cm3 (variable, as is the velocity), and it contains a variable interplanetary magnetic field (IMF) of (typically) 2–5 nT. The IMF is produced by stretched-out magnetic field lines originating on the Sun, a process described in the section on magnetic storms and plasma flows, referred to in what follows as simply MSPF. Physical reasons (MSPF) make it difficult for solar wind plasma with its embedded IMF to mix with terrestrial plasma whose magnetic field has a different source. The two plasmas end up separated by a boundary, the magnetopause, and the Earth's plasma is confined to a cavity inside the flowing solar wind, the magnetosphere. The isolation is not complete, thanks to secondary processes such as magnetic reconnection (MSPF)—otherwise it would be hard for the solar wind to transmit much energy to the magnetosphere—but it still determines the overall configuration. An additional feature is a collision-free bow shock that forms in the solar wind ahead of Earth, typically at 13.5 RE on the sunward side. It forms because the solar velocity of the wind exceeds (typically 2–3 times) that of Alfvén waves, a family of characteristic waves with which disturbances propagate in a magnetized fluid. In the region behind the shock ("magnetosheath") the velocity drops briefly to the Alfvén velocity (and the temperature rises, absorbing lost kinetic energy), but the velocity soon rises back as plasma is dragged forward by the surrounding solar wind flow. To understand the magnetosphere, one needs to visualize its magnetic field lines, that everywhere point in the direction of the magnetic field—for example, diverging out near the magnetic north pole (or geographic southpole), and converging again around the magnetic south pole (or the geographic northpole), where they enter the Earth. They are discussed in MSPF, but for now they can be visualized like wires which tie the magnetosphere together—wires that also guide the motions of trapped particles, which slide along them like beads (though other motions may also occur). When the first scientific satellites were launched in the first half of 1958—Explorers 1 and 3 by the US, Sputnik 3 by the Soviet Union—they observed an intense (and unexpected) radiation belt around Earth, held by its magnetic field. "My God, Space is Radioactive!" exclaimed one of Van Allen's colleagues, when the meaning of those observations was realized. That was the "inner radiation belt" of protons with energies in the range 10-100 MeV (megaelectronvolts), attributed later to "albedo neutron decay," a secondary effect of the interaction of cosmic radiation with the upper atmosphere. It is centered on field lines crossing the equator about 1.5 RE from the Earth's center. Later a population of trapped ions and electrons was observed on field lines crossing the equator at 2.5–8 RE. The high-energy part of that population (about 1 MeV) became known as the "outer radiation belt," but its bulk is at lower energies (peak about 65 keV) and is identified as the ring current plasma. The trapping of charged particles in a magnetic field can be quite stable. This is particularly true in the inner belt, because the build-up of trapped protons from albedo neutrons is quite slow, requiring years to reach observed intensities. In July 1962, the United States tested an H-bomb high over the South Pacific at around 400 km in the upper atmosphere, in this region, creating an artificial belt of high-energy electrons, and some of them were still around 4–5 years later (such tests are now banned by treaty). The outer belt and ring current are less persistent, because charge-exchange collisions with atoms of the geocorona (see above) tends to remove their particles. That suggests the existence of an effective source mechanism, continually supplying this region with fresh plasma. It turns out that the magnetic barrier can be broken down by electric forces, as discussed in MSPF. If plasma is pushed hard enough, it generates electric fields which allow it to move in response to the push, often (not always) deforming the magnetic field in the process. A view from the IMAGE satellite showing Earth's plasmasphere using its Extreme Ultraviolet (EUV) imager instrument. A magnetic tail or magnetotail is formed by pressure from the solar wind on a planet's magnetosphere. The magnetotail can extend great distances away from its originating planet. Earth's magnetic tail extends at least 200 Earth radii in the anti-sunward direction well beyond the orbit of the Moon at about 60 Earth radii, while Jupiter's magnetic tail extends beyond the orbit of Saturn. On occasion Saturn is immersed inside the Jovian magnetosphere. The extended magnetotail results from energy stored in the planet's magnetic field. At times this energy is released and the magnetic field becomes temporarily more dipole-like. As it does so that stored energy goes to energize plasma trapped on the involved magnetic field lines. Some of that plasma is driven tailward and into the distant solar wind. The rest is injected into the inner magnetosphere where it results in the aurora and the ring current plasma population. The resulting energetic plasma and electric currents can disrupt spacecraft operations, communication and navigation. Magnetic fields in the magnetosphere arise from the Earth's internal magnetic field as well as from electric currents that flow in the magnetospheric plasma: The plasma acts as a kind of electromagnet. Magnetic fields from currents that circulate in the magnetospheric plasma extend the Earth's magnetism much further in space than would be predicted from the Earth's internal field alone. Such currents also determine the field's structure far from Earth, creating the regions described in the introduction above. Unlike in a conventional resistive electric circuit, where currents are best thought of as arising as a response to an applied voltage, currents in the magnetosphere are better seen as being caused by the structure and motion of the plasma in its associated magnetic field. For instance, electrons and positive ions trapped in the dipole-like field near the Earth tend to circulate around the magnetic axis of the dipole (the line connecting the magnetic poles) in a ring around the Earth, without gaining or losing energy (this is known as Guiding center motion). Viewed from above the magnetic north pole (geographic south), ions circulate clockwise, electrons counterclockwise, producing a net circulating clockwise current, known (from its shape) as the ring current. No voltage is needed—the current arises naturally from the motion of the ions and electrons in the magnetic field. Any such current will modify the magnetic field. The ring current, for instance, strengthens the field on its outside, helping expand the size of the magnetosphere. At the same time, it weakens the magnetic field in its interior. In a magnetic storm, plasma is added to the ring current, making it temporarily stronger, and the field at Earth is observed to weaken by up to 1-2 percent. The deformation of the magnetic field, and the flow of electric currents in it, are intimately linked, making it often hard to label one as cause and the other as effect. Frequently (as in the magnetopause and the magnetotail) it is intuitively more useful to regard the distribution and flow of plasma as the primary effect, producing the observed magnetic structure, with the associated electric currents just one feature of those structures, more of a consistency requirement of the magnetic structure. As noted, one exception (at least) exists, a case where voltages do drive currents. That happens with Birkeland currents, which flow from distant space into the near-polar ionosphere, continue at least some distance in the ionosphere, and then return to space. (Part of the current then detours and leaves Earth again along field lines on the morning side, flows across midnight as part of the ring current, then comes back to the ionosphere along field lines on the evening side and rejoins the pattern.) The full circuit of those currents, under various conditions, is still under debate. Because the ionosphere is an ohmic conductor of sorts, such flow will heat it up. It will also give rise to secondary Hall currents, and accelerate magnetospheric particles—electrons in the arcs of the polar aurora, and singly-ionized oxygen ions (O+) which contribute to the ring current. Regardless of whether they are viewed as sources or consequences of the magnetospheric field structure, electric currents flow in closed circuits. That makes them useful for classifying different parts of the magnetic field of the magnetosphere, each associated with a distinct type of circuit. In this way the field of the magnetosphere is often resolved into 5 distinct parts, as follows. The internal field of the Earth ("main field") arising from electric currents in the core. 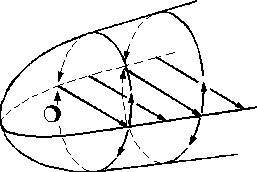 It is dipole-like, modified by higher harmonic contributions. The ring current field , carried by plasma trapped in the dipole-like field around Earth, typically at distances 3–8 RE (less during large storms). Its current flows (approximately) around the magnetic equator, mainly clockwise when viewed from north. (A small counterclockwise ring current flows at the inner edge of the ring, caused by the fall-off in plasma density as Earth is approached). The field confining the Earth's plasma and magnetic field inside the magnetospheric cavity. The currents responsible for it flow on the magnetopause, the interface between the magnetosphere and the solar wind, described in the introduction. Their flow, again, may be viewed as arising from the geometry of the magnetic field (rather than from any driving voltage), a consequence of "Ampére's law" (embodied in Maxwell's equations) which in this case requires an electric current to flow along any interface between magnetic fields of different directions and/or intensities. The system of tail currents. The magnetotail consists of twin bundles of oppositely directed magnetic field (the "tail lobes"), directed earthwards in the northern half of the tail and away from Earth in the southern half. In between the two exists a layer ("plasma sheet") of denser plasma (0.3-0.5 ions/cm3 vs. 0.01-0.02 in the lobes), and because of the difference between the adjoining magnetic fields, by Ampére's law an electric current flows there too, directed from dawn to dusk. The flow closes (as it must) by following the tail magnetopause—part over the northern lobe, part over the southern one. The Birkeland current field (and its branches in the ionosphere and ring current), a circuit is associated with the polar aurora. Unlike the 3 preceding current systems, it does require a constant input of energy, to provide the heating of its ionospheric path and the acceleration of auroral electrons and of positive ions. 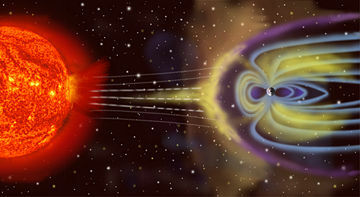 The energy probably comes from a dynamo process, meaning that part of the circuit threads a plasma moving relative to Earth, either in the solar wind and in "boundary layer" flows which it drives just inside the magnetopause, or by plasma moving earthward in the magnetotail, as observed during substorms (below). Earlier it was stated that "if plasma is pushed hard enough, it generates electric fields which allow it to move in response to the push, often (not always) deforming the magnetic field in the process." Two examples of such "pushing" are particularly important in the magnetosphere. The THEMIS mission is a NASA program to study in detail the physical processes involved in substorms. The more common one occurs when the north-south component Bz of the interplanetary magnetic field (IMF) is appreciable and points southward. In this state field lines of the magnetosphere are relatively strongly linked to the IMF, allowing energy and plasma to enter it at relatively high rates. This swells up the magnetotail and makes it unstable. Ultimately the tail's structure changes abruptly and violently, a process known as a magnetic substorm. Magnetic reconnection in the near-Earth magnetotail, producing a disconnected "plasmoid"
One possible scenario (the subject is still being debated) is as follows. As the magnetotail swells, it creates a wider obstacle to the solar wind flow, causing its widening portion to be squeezed more by the solar wind. In the end, this squeezing breaks apart field lines in the plasma sheet ("magnetic reconnection"), and the distant part of the sheet, no longer attached to the Earth, is swept away as an independent magnetic structure ("plasmoid"). The near-Earth part snaps back earthwards, energizing its particles and producing Birkeland currents and bright auroras. As observed in the 1970s by the ATS satellites at 6.6 RE, when conditions are favorable that can happen up to several times a day. Substorms generally do not substantially add to the ring current. That happens in magnetic storms, when following an eruption on the sun (a "coronal mass ejection" or a "solar flare"—details are still being debated, see MSPF) a fast-moving plasma cloud hits the Earth. If the IMF has a southward component, this not only pushes the magnetopause boundary closer to Earth (at times to about half its usual distance), but it also produces an injection of plasma from the tail, much more vigorous than the one associated with substorms. 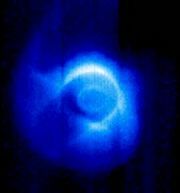 The plasma population of the ring current may now grow substantially, and a notable part of the addition consists of O+ oxygen ions extracted from the ionosphere as a by-product of the polar aurora. In addition, the ring current is driven earthward (which energizes its particles further), temporarily modifying the field around the Earth and thus shifting the aurora (and its current system) closer to the equator. The magnetic disturbance may decay within 1–3 days as many ions are removed by charge exchange, but the higher energies of the ring current can persist much longer. ↑ Petrinec, S. M., Russell. Influencing Factors on the Shape and Size of the Dayside Magnetopause Advances in Space Research, 18, (8)207-(8)212, 1996. Retrieved February 24, 2009. Carlowicz, Michael J., and Ramon E. Lopez. 2002. Storms from the Sun: The Emerging Science of Space Weather. Washington, DC: Joseph Henry Press. ISBN 0309076420. Stern, D.P., and M. Peredo. Nov. 20, 2003. The Exploration of the Earth's Magnetosphere. NASA. Retrieved November 25, 2008. Walt, Martin. 2005. Introduction to Geomagnetically Trapped Radiation. Cambridge Atmospheric and Space Science Series. Cambridge: Cambridge University Press. ISBN 978-0521616119. Real-time monitoring of the Earth's magnetic field. National Geomagnetism Program, USGS. This page was last modified on 7 August 2018, at 18:12.